Kara's ship lands in Siberia. Some unidentified people in robotic suits (possibly from the U.S government, but it's not stated) show up to apprehend her. Kara thinks she's dreaming, discovers she has powers and fights them. Then Superman arrives. 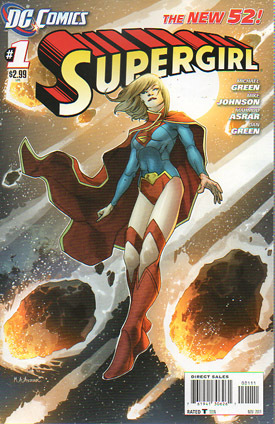 Story - 3: This is the second "Supergirl #1" that I've reviewed, and yet possibly the third or fourth (fifth? I lost count) semi-origin story we've gotten for Kara. To say I'm tired of them would be an understatement, but presuming we HAD to have one (which we didn't, as Superman didn't have one, but I digress), let's look at what we have. If you have not read my above synopsis of the issue, please do so now. That is not truncated. I have not left out a lot of details. That is quite literally ALL that happens in this issue. There's nothing else. At all. You could have condensed this entire issue into 5 or 6 pages and lost nothing. There's just... nothing here. At all. Why not start with Kara already established like Superman? What is the benefit to yet another arrival story? Especially when this is maybe 1/3 to 1/4 of the story you could easily fit within these pages? It just doesn't make any sense, honestly. This wasn't needed. It feels like filler and it's only the first issue. Kara can't seem to catch a break. And I'm sorry, but trying to pass her costume off as a Kryptonian "graduation" outfit? Really? On Krypton, women wear knee-less boots and singlets with the leg holes cut so high as to show off their thighs and sides almost right up to their belly buttons? To GRADUATE in? Krypton has a pretty low estimation of a learned woman's skills, then, if they make them wear THAT just to get their diploma. Art - 4: I enjoyed the art a good deal, Kara looked the same throughout the book and there was a good bit of personality conveyed in her face. I also really liked the layout/design of her discovery of her super-hearing. I know that's not all necessarily the art as much as the type laid in after, but it was still nicely done and well conveyed. Cover Art - 2: When I see the bottom half of that costume, the first thing I think is "regal and respectful, as befitting a scholar at graduation".